Tobias Reichling (on the left) and Adrian Schütz (on the right) both have studied computer science with main subject media studies at the university of Siegen. The software PicToBrick was developed in the context of their thesis with the title: "Generating mosaics from multicolor raster graphics by optimized interaction of improved and newly developed quantisation and tiling algorithms". The idea for this thesis and the involved software PicToBrick is a result of Tobias’ longtime hobby LEGO (see Tobias' Internet page concerning his hobby LEGO). 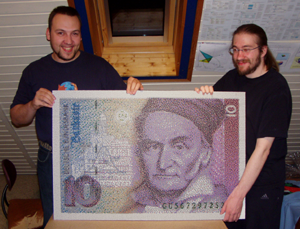 The photo was taken in August 2006 after finishing the first mosaic project "10 DM Schein mit Johann Carl Friedrich Gauß" with Ministeck bricks (38.400 pixels). Univ.-Prof. Dr. Wolfgang Merzenich and Dipl.-Math. Simon Budig, section computer languages, for supporting our idea, for their excellent scientific management and advice and their competent and trend-setting assistance. Jan Beyer (Denmark, Billund) LEGO group, for the gracious donation to help us to generate the mosaic "Albert Einstein" for the presentation of our thesis. Helmut Gottwald(Langenzenn-Kirchfembach), Ministeck corporation for the gracious donation to help us to generate the mosaic "10 DM Schein mit Johann Carl Friedrich Gauß" for the presentation of our thesis. Vanessa Graf (Drensteinfurt), Christine Schütz (Siegen) and Oliver Pfaff (Siegen) for actively supporting the construction of both mosaics above-mentioned. Robert Griebl (München) und Marcus Klein (Olpe) for testing our software. Gisela Schütz (Siegen) for the final control of our English translation. Barbara Werth (Netherlands), Casper van Nimwegen (Netherlands), Didier Enjary (France), Marco Chiappa (Italy), Jakob Bindslet (Denmark) and Juan Macias (Spain) for the language files in their national language.